If I had to pick one of my favorite moments of all time, I might just have to choose the time I went to Chaing Mai Thailand with just me and my hubs (pre having kids) and got to spend all day with a Thai chef, learning how to cook Thai food. Seriously a foodies dream come true. We got to first shop for fresh produce (including a visit to a local stand that made fresh coconut milk right before our eyes) and then got to cook three traditional Thai dishes from start to finish. The best part was getting to eat them afterwards. Red curry was always a favorite of mine but it became extra special after this moment. As soon as I got home from our trip, I started to recreated this traditional Thai dish in my own kitchen and I haven’t stopped since. My husband and I are both obsessed with this meal, and my two year old daughter gobbles it up too. My son - not so much a big fan of spice. It can be tricky trying to enjoy different types of foods with kids who are learning to appreciate different textures and flavors. I shared the other day on Instagram about how kids need to feel comfortable with foods solo before they will like them/accept them as a mix with lots of other foods. So when I serve it to my kids I take into consideration whose eating it and which one of my kids would be less intimidated if I separated the foods out into individual compartments aka deconstructing the meal. Here’s how I serve it two ways to my two year old and my five year old. Anyways, I want to get right down to business and share one of my all time favorite meals with you all because I love you, that’s why. Im guessing you are a fan of spice like me if you decided to read this far but in all reality, this dish isn’t super super spicy. “Medium spice” I would call it. And of course, you can always kick it up (or down) a notch just by adding more or less curry paste. Prepare your rice or quinoa ahead of time so that when the curry is ready, you can pour it over. In a large stainless steel or ceramic pot, bring coconut oil to medium heat. Add the chicken thighs and par cook them each, about 3 minutes, flipping to brown each side a bit. Remove chicken onto a cutting board. In the remaining oil (you can add a bit more if the pot is lacking) add the onions first and then the mushrooms and cook until they are soft (about 7 minutes). While the onions and mushrooms cook, go ahead and cut your chicken thighs into about 1 + 1/2 inch strips. Remove onto a separate plate. In the pot, add 1 full jar + 1/2 of another jar of the red curry paste (or more or less depending on how spicy you want it to be) plus the white fatty part of the coconut milk over medium heat. Stir the coconut fat and the curry paste together while it heats up and begins to combine together. Once it combines, you can pour the rest of the coconut milk into the pot and bring to a medium heat. At this time, add the chicken broth, the onions and mushrooms, the veggies and the chicken. You can add the salt and pepper, onion powder, agave and curry powder at this time too. It will take some time to bring to a boil. Stir well. Once it begins to boil, lower the heat to a gentle simmer and cover with a lid. Cook on low heat for about 30-40 minutes. Add the pineapple chunks to top it off. It tastes best when it is allowed to rest for about 10 minutes before serving. Serve over your favorite rice or grain. If you make this kitchen favorite of mine, comment below and tell me what you think! It has been a while since I made a recipe and though “Oh, my gosh. People NEED this in their life!” Not trying to brag, even though I kind of am, but this pizza is so legit you guys. So nourishing and so delicious too. Did I mention its not only gluten free but also made with cauliflower crust and a bunch of other delicious veggies and real foods?! Wow. I’m such a foodie that I even sound ridiculous to myself. I’m sorry you guys, but it really is that good! Even my husband, who would rather eat real pizza any day was raving about this Sweet Potato Pizza. Whoever even thought of the brilliant idea of cauliflower pizza crust anyway?! Seriously!! What a genius. I very much would like to high five this person and become their friend. If you have never tried it, don’t hate. It actually tastes pretty darn amazing considering its made out of a cruciferous veggie. And your kids won’t have any clue either. Unless they’re one of those super suspicious guys. And no, I don’t really hide it from my kids that I’m serving them pizza made out of veggies. They pretty much expect veggies to be part of every meal equation in my house at this point but I don’t really have to highlight it either because after all, it is PIZZA. I know what you’re thinking though. You’ve tried making cauliflower crust before and you DO NOT have time for that. And its messy as heck too. You’re so not going there again. Don’t worry, I’ve got you covered boo. I don’t bother with homemade cauliflower crust anymore either. Unless I have a lot of time on my hands and a lot of patience, nope, not going there. Thankfully for you and I both, I finally found a store-bought cauliflower pizza crust that is made out of legit ingredients with no fluff or fillers and tastes delicious. Most other brands I’ve used in the past have odd fillers and use mozzarella cheese (I don’t eat conventional dairy). But this brand below has all wholesome, real food ingredients that make a gluten-free organic mama like me very, very happy! One more thing, I forgot to mention before I give you the recipe. Its a total week-night dinner time saver. It only takes about 30 minutes total cooking time to throw together. A win-win-win in my book! Before hand, cook your sweet potatoes. I threw 2 sweet potatoes into the Instantpot for 15 minutes on pressure cook until they were fork tender. Scoop out the insides of the sweet potatoes and set them aside. Remove crusts from the package and set them on a baking sheet. Set the oven for 400 degrees. Chop the onions, garlic, sausage and sun-dried tomatoes. Heat your oil in a skillet over medium heat. Add the sausage to the pan and let it begin to cook for about 3 minutes. Add the onions and garlic and saute in the oils until they begin to soften and soak up the flavor of the sausage, about 7 minutes. Add the sun-dried tomatoes and the pizzas sauce and combine well. Turn the heat to low and cover and cook for about 10 minutes. Remove the cover and add in the softened sweet potato mix and stir it into the pizza sauce mixture until its fully combined. Add your salt, pepper, garlic powder and basil and combine. You can garnish with fresh basil on top if you would like. Once the sweet potato sausage sauce is ready, spread it evenly onto the two cauliflower crusts and bake for 10-14 minutes or until the crust begins become slightly crisp. 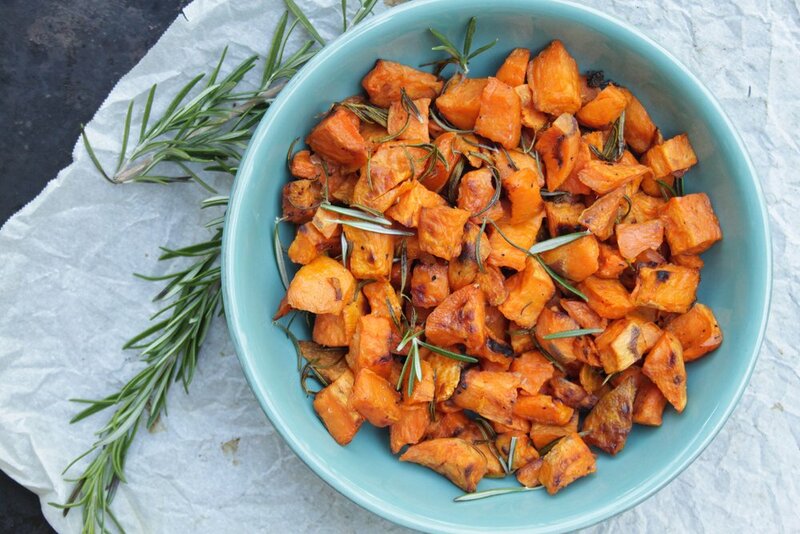 These Roasted Rosemary Sweet Potatoes are simple, healthy and sweet and the perfect addition to any weeknight dinner. If you know me at all, you know I’m always trying to come up with healthy recipes to get my kiddos to enjoy their veggies and this is one of my go-to’s in that category. And to be quite frank, I’m not really sure if I could survive the grain-free lifestyle without my beloved sweet potato. When I’m craving carbohydrates, one of my favorite treats is to eat a baked sweet potato with some good old butter, agave, salt and cinnamon. Sweet and fulfilling without that guilt free filling. Not only do my kids love these little guys, but every time I make them for guests, they always ask for the recipe and they can never believe how easy they are! Seriously, they really are THAT easy. Like idiot proof easy. I love to save some extra in the fridge to throw over salads the next day and they also work great as a make-ahead weekday meal-prep situation. With only a few simple ingredients and a roasting pan, you’re pretty much good to go, so I’m not sure what else could really hold you back from enjoying this crowd-pleasing side. Line a baking sheet with parchment paper and set the oven for 400 degrees Fahrenheit. Peel and chop the potatoes and throw them into a mixing bowl. Throw in the rosemary, the ghee, garlic powder and salt and pepper and toss them all together with your hands. After you’re finished giving them a good toss, transfer them to the baking sheet, make sure that they are spaced out well to ensure they get crispy instead of mushy. Put them in the oven for roughly 50 minutes, turning halfway through with a spatula to cook evenly on both sides. You want them to be slightly browned and crispy on the outside but not overcooked. If you’re vowing to give up gluten and dairy walking into the New Year, you’re probably worried you’re going to have to sit on the bench eating salad while everyone else gets to enjoy delicious food. Well, I’m here to tell you that just doesn’t have to be the case. No sir. Not even one bit. Not when you start to get creative and throwing in some curve balls like these flavor-full Thai-Style Sweet Potato Sliders. They are tangy and sweet and bursting with flavor. Add your favorite green veggie on the side and my Five-Minute Guac as a topper and you’re basically in gluten-free heaven. We love them so much I’ve been keeping them on the weekly rotation around here. Mostly because they cook up in under 30 minutes time but the other factor that always weighs in are that my kids love them too. Making them is super simple and pretty darn quick if you ask me. You’re going to bake up some sweet potatoe chips in the oven and in the meantime you’re going to pan fry your meaty, veggie mixture and then add in some guac for good measure. Heat oven to 400 degrees. On a baking sheet lined with parchment paper, lay out sliced sweet potato discs side by side until you covered the pan (using an extra pan if needed). Dab/brush a bit of coconut oil on each side and sprinkle them with some salt and pepper. While oven is heating, dice up your onion, garlic and shred your carrots. Over medium heat on the stovetop, heat up ghee or coconut oil until hot. Begin to saute all the veggies for 3-4 minutes or until onions soften. Once they soften, add the beef and begin to use your spatula to break it up evenly. Add in the salt and pepper, onion powder, ginger powder, agave, coconut aminos and Worcester and cook and combine together while the beef cooks (about 8-10 minutes). Meanwhile, put the sweet potatoes in the oven for about 12-14 minutes or until they begin to crisp (turning them half-way through). Once the beef mixture is cooked and sweet potato chips are done crisping, serve it by adding a spoonful of the beef mixture atop a sweet potato chip and add one more to the top to make it sandwich style. Whip up some Five Minute Guacamole and your favorite veggie on the side. Top the sliders with some guac and some spicy chipolte mayo or sriracha sauce if you want an extra kick. As we walk into this month of gratitude and thanksgiving, I am trying to incorporate some new and fun ways to cultivate gratitude in our home and even though they’re young, my kids totally understand thanksgiving! Its so sweet to hear the things they’re thankful for that it makes me even more thankful! Did you know that verbally expressing gratitude and thanksgiving can cultivate physiological mental and physical health changes and essentially RE-WIRE your brain for wellness?! That blows me away! If you don’t believe me, watch some lectures on YouTube by neuroscientist Dr. Caroline Leaf! What little things are you thankful for walking into this month of Thanksgiving? Let me know in the comments below! Add in the remaining ingredients and combine with the fork until you reach your desired consistency. I like to leave some big chunks here and there! I am a big fan of one pot meals, like really really big fan. Hence why I’m constantly posting about my life-long passion for soups. The main reason is that I make way less of a mess dirtying multiple pans but the other reason is because mixing everything together in one big pot just gives me more reason to add in as many veggies as possible. I mean, I guess I don’t really even need to explain much further about the beauty of one pot meals. You weren’t born yesterday. You get it. If you’re a busy mom like me, you get it fo sho. I’m also a big fan of egg rolls except for I don’t eat them anymore. Why? Because they’re made with flour (gluten) that I don’t eat, SOY (which has been linked to breast cancer), probably deep fried in canola oil and packed with MSG. I might be exaggerating a tad on how bad fast food egg rolls are but you get the point. There’s always a way to make something delicious that you LOVE but can no longer eat anymore, healthy. This One Pot Cauliflower Rice Egg Roll in a Bowl is SO good you guys. I promise you will feel like you’re eating old-school Chinese takeout and feel victorious since you knew it was all wholesome healthy foods for your body and brain. And you’ll feel even more victorious when you realize you don’t even have to clean more than one pan. To make this recipe even easier I use riced cauliflower that I buy in the frozen section of Whole Foods, because who has time for dicing up cauliflower anyways? Truthfully, its really not that difficult it just makes a bit of a mess in my experience. It is SO SO easy to make too! Here’s how I made this scrumptious Chinese-wanna be delight. Chop onion and garlic. Grate the carrots (or us a food processor). Heat the two oils in a pan over medium heat on the stove-top. Once heated, add the onions for about 5 minutes or until they begin to soften. Add the garlic, cauliflower rice, carrots and chives (save a few to season on top) and stir. Cook for about 3 minutes. Add the ground beef and begin to break it apart with a spatula into the mixture as it begins to cook. Stir in the ginger and coconut aminos with the beef. As it cooks, season the mixture with salt, pepper and onion powder and stir. From here, cook on medium-low heat for about 10 minutes or until beef is cooked and veggies are all semi softened. Open up a spot with your spatula inside the pan mixture for the eggs. Scramble the two eggs right inside the same pan (in its own space) until cooked. Then mix the egg into the mixture. Add the remaining chives to season on top. If the mix needs a little more seasoning, just add more coconut aminos right on top or to individual bowls. **You could definitely add some rice or quinoa into this mixture to add a bit more bulk to it and you could always eliminate the eggs if you are egg-free! You guys, I have been wanting to update my chicken soup recipe for some time now. I wanted to bring this lovely healthy comfort food to a whole new level of healthy by adding in some of my favorite superfoods. I was a little nervous it might change the flavor too much and be a turn off to my kids, but it was a huge hit with them too. In fact, my son told me it was the “best chicken soup he ever had.” I can’t promise I didn’t tear up a bit. It’s not too often this mama get’s much love and appreciation around here. So what super-foods did I add to this already delectable meal, you might ask? I added a huge bunch of kale, some turmeric root, parsley and lots of garlic! Myself and every other health conscious person has probably blabbed your ear off already about the anti-aging, anti-inflammatory, gut healing and immune boosting benefits of collagen in bone broth. But if you have been living under a rock or avoiding Whole Foods at all costs, you can check out all the reasons I love bone broth here. But seriously, if you are struggling with any gut-health issues, I strongly encourage you to see if adding some homemade bone broth to your regular daily routine would be beneficial for you! Sure, you can make this recipe with store bought bone broth to save time and there are some really good options out there these days. But I’m telling you, friend, you will be missing out on that homemade feel-good comforting flavor if you do. And plus, its super cheap and easy to make! To make the broth, if you want to skip many ingredients to save time, you can do that too and it will still be better than store bought! Just slow cook some organic bones for 12-24 hours with some onion, salt and pepper and a dash of apple cider vinegar (for nutrient extraction) and viola! Just one more note - I used ghee and coconut oil instead of olive oil due to all I’ve been reading about how extra virgin olive oil is an unstable oil and how heat can destroy the healthy Omega-3 content of it. Okay, you’ve waited long enough! Thanks for your patience, friends. Here it is! Place the carcass (chicken removed) and all the bones into a large crockpot with a lid. Cover with water, add apple cider vinegar and bay leaf and cover. Cook on low for 12-24 hours, adding water if necessary. Water should only slightly cover the top of the contents. After 12-24 hours, strain and remove bones and carcass for delicious homemade bone broth. Season if preferred. In a large pot, heat the ghee and coconut oil over medium heat. Add onions for about 4 minutes until they begin to soften, then add garlic, celery, carrots and turmeric root and cook for about 4 minutes or until they begin to soften. Once veggies began to soften, add the parsley, the chicken broth (plus 1/3 of the store bought container), the chicken and fresh parsley. Add all the seasonings and cook on low heat for about 30 minutes. Add the chopped kale in the last 3 minutes of cooking time. Add a few remaining sprigs of fresh parsley on top and season with salt and pepper to your taste. Add a tablespoon or 2 of cooked quinoa or rice to a bowl and then pour the soup over top to serve. D E A L, you guys! I can’t even explain to you how it has changed my life. It is so delicious and so ridiculously loaded with nutrition that you will be wanting to keep it in the meal rotation for every week. The greatest part is your kids wont even think anything differently about it, they will just see noodles and sing a shout of praise. No, I’m not saying you should necessarily hide whats in the sauce from them. Actually, I feel quite the opposite. Sneaking veggies into foods without your kids’ knowledge has been known to only further distrust and anxiety around the dinner table with picky eaters. I’m just saying that they won’t be able to really taste the difference and sooner or later this will just be what comes to mind when they think of spaghetti. My kids sometimes like to help me throw the veggies into the food processor and watch them be ground up for going into the sauce. Cooking with kids prepares them for the smells and sights of the meal to come. If only it was easy and mess free! Okay, back to the awesome sauce. So I call this Loaded Veggie Meat Sauce because it is literally LOADED with veggies. S I X veggies and T W O powerful superfoods! It has onions, garlic, kale, celery, carrots and tomatoes. It also includes fresh basil and turmeric, both potent super foods packed with nutritional value. It is also packed with iron and tons of healthy fats. Um, did I mention NOODLES?! Ok enough yapping, here’s how to make it! Rinse and dry all the veggies. Add the onion and garlic to the food processor and process until finely minced. Meanwhile, heat the ghee and coconut oil mixed in a large pot over medium heat. Add the minced onions and garlic to the oils and let cook for a minute or too until soft while you puree the other veggies. Add the carrots to the food processor and finely mince. Add to the pot and mix into the onion mix. Do the same with the kale, celery and turmeric root and add the minced veggies into the pot and stir. Drizzle a few drizzles of EVOO over the top of the veggies and cook on medium low heat for about 5-6 minutes until they begin to soften. Add the spices and salt and pepper. Add the ground beef and chop it with a spatula while it browns. Stir it in well and make sure to break up any large chunks. Cook the beef and veggies together for about 7 minutes or until meat is almost all browned. Add the tomato sauce. Turn the heat back to about medium heat or until it simmers and leave it this way for about 5 minutes. After 5 minutes of simmering, turn the heat down to low and cover to simmer for 30 minutes. When its finished, throw in the fresh basil while its still hot and stir in to combine. Serve this meat sauce over gluten-free quinoa spaghetti noodles or plain quinoa. Make sure to place a few noodles on top (and maybe even a little Parmesan cheese) for all those visual picky eaters. My husband is always begging me to make chicken fried rice. I wanted to try to make a healthier version, without all the extra post-meal guilt and calories and I also wanted to boost the nutritional value a bit. I decided to swap out the white rice for a mixture of cauliflower rice and quinoa and let me tell you, this turned out SO good. In fact, I have made it three times since and it’s been polished off completely by the family each time. While I like the taste of frozen veggie mixtures in fried rice, they aren’t exactly through the roof on the nutritional charts, you guys. So adding cauliflower and broccoli made it a complete meal for us and truthfully, I didn’t really miss the “real deal” one bit. While the adults in the house enjoy casseroles and other mixtures such as this, my little guy sometimes has a hard time with them. That doesn’t mean I just stop offering them completely. REMEMBER, between the ages of 2 1/2 - 4 years old (but ESPECIALLY at the age of 3) ALL kids go through a “picky eating phase” and this is considered C O M P L E T E L Y N O R M A L.
Try to talk them THROUGH the meal instead of talking them INTO the meal. Talk about all the sensory components of the foods like textures, colors and shapes of different veggies (how they look, feel and taste). It’s hard, you’re doing a great job, way better than you think!! So if you’re like me and craving take-out style chicken fried rice but also trying to offer a nutritional family meal, give it a try and let me know what you think you guys! First, cook the chicken. I boiled some water and added the thighs, lowered the heat a bit and cooked them for about 15 or until cooked through. Next dice the onion, garlic and roughly chop the mushrooms. Next, add mixed veggies and stir for about 5 minutes. Add additional coconut oil or ghee to pan. Add the cauliflower rice, quinoa, sesame oil and coconut aminos (or soy sauce) and cook on medium heat for about 5 minutes. Make an open spot in the pan to scramble the eggs and mix into the mixture. Fork shred the chicken and add to pan. Add onion powder and s + p to taste. Serve with broccoli and sesame seeds. Enjoy! You guys, I have been SO excited to share my household favorite, DIY Buddha Bowls + my favorite recipe for marinating steak. It is so so good! I can’t even describe the level of deliciousness going on here. To give you an idea as to how delicious, I will say, I would rather eat these steak bowls at home while my kids fling food all over the walls than go out to eat at a fancy restaurant. That’s how good!! So marinating does takes a little prep work, but it is worth it in the end. You can do it on a Sunday afternoon or if you have a few minutes during nap time and it makes cooking dinner a breeze! Honestly, I don’t know how anyone eats healthy without a little meal prepping. Whether it’s marinating steaks, putting foil over some sweet potatoes and popping them in the oven or pre- chopping some veggies, on any given day it’s the only way I get a healthy, quick family dinner on the table. The awesome thing about buddah bowls is you can add any combination of veggies you like. I almost always use broccoli, steak and avocado but this time I decided to try sweet potatoes crisps instead. My husband and I love mushrooms but my son hates them so I let him pick what veggie combination he wants in his own bowl. Cut the strips into four. Sprinkle them with salt and pepper. Use a knife to make some small inscisions down each side (to help Marinade penetrate more deeply) Run along with the striations in the Steak. Marinate these in a zip-lock bag overnight or for a full day or two. Boil some water in another pot and add broccoli. Lower heat to a medium high setting and cook for about 5-6 minutes. Prepare and cut any other veggies you would like. Slice avocados, brown some mushrooms, boil some eggs, etc. I put sliced sweet potatoes in the toaster oven for about 10 minutes each side to make these sweet potato crisps. While rice is still cooking on low, make the steak. Add EVOO to pan over medium high heat. Add strips of steak and lower heat down to a 3 and cook on each side for about 7-8 minutes. You'll know its ready when it is just a tiny bit pink inside. Place them in individual bowls over rice. When broccoli is finished, you can add a little butter and salt for seasoning. Sprinkle sesame seeds + sriracha mayo if you like it spicy! ** I mix organic mayo + sriracha to make it. I know I can’t be alone about feeling the need to detox after a long weekend. 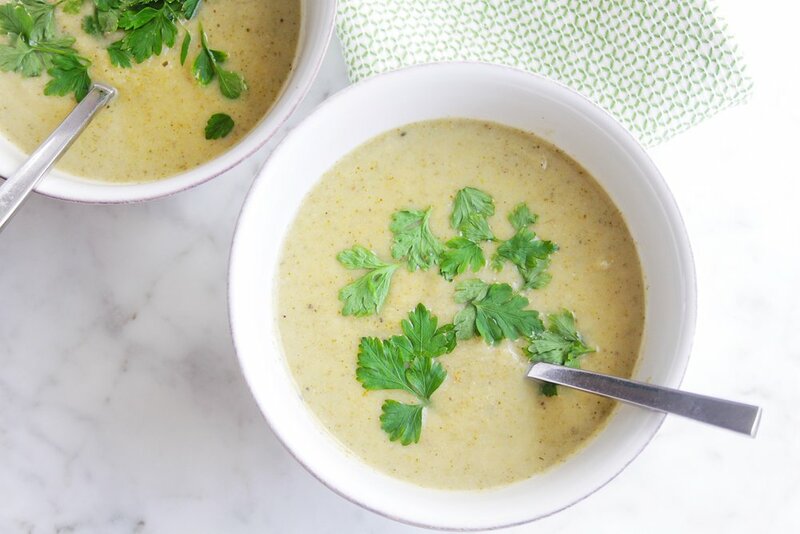 Broccoli soup just seems like the perfect remedy for negating weekend eats. My mom used to make the best broccoli soup when I was growing up. I remember devouring it and always wanting seconds. There is something about the broccoli combined with the onions and garlic and the creamy texture of the heavy cream that really makes the perfect flavor combination. I wanted to make something resembling my mom's broccoli soup but without the dairy and some added cauliflower for a more creamy texture. I was surprised it turned out so delicious! To be honest, I made mine a little on the spicy side (I added a LOT of garlic) so my kids didn't really like it. Next time, I'll try to tame down the garlic and see what happens. Here’s how to make it..
Add a few swirls of EVOO to pan over medium heat. Add chopped onions and stir until soft. Add sardine (adds flavor) and garlic and mix together. Once onions have softened a bit, add broccoli, cauliflower, parsley, broth and the creamy top of the coconut milk can (save the rest of the milk for another time.) Add spices and salt and pepper. Bring to a soft boil, then cover and turn to low heat and let it simmer for 45 minutes to an hour. Once soup is soft and ready, use a hand blender to blend it into a creamy blended texture. Taco night happens on the regular in our house and I love enjoying a real deal tortilla-style taco just as much as anyone. In fact, I think tortillas might be one of the most delicious things I have ever tasted. Not exactly low-carb, new year diet friendly though. For the most part, I try to avoid gluten and processed grains like bread, pasta and tortillas but my kids enjoy them more frequently than I'd like to admit. So I decided on a whim to bake up some sweet potatoes, scoop out the centers, and make my taco with one of these guys and call it a day. I'm so glad I did too, because it was so delicious and satisfying (and guilt free) that I don't think I'll be going back to the norm anytime soon. I used a scoop of sugar free plain organic yogurt, some cilantro and all the yummy taco toppings to make it even better. They would be great with a huge scoop of guacamole or some melted cheese too! Sweet potatoes are so versatile! You can add them in as a substitute for any meal in my book, really! Sweet potato pizzas are one of my favorite gluten-free dinners. Not only are they versatile, they are just the right amount of sweet for kicking sugar cravings to the curb AND they are full of vitamins and nutrients! If I am really craving carbs and sugar, I like to bake a sweet potato and serve it with grass-fed butter and agave. It really does work like a charm. So, try it out! Swap out bread for a sweet potato in any of your favorite dishes and see what happens! Disclaimer: I haven't tried these with the kids yet, but maybe in the future! Since they aren't really trying to cut back on the calories (hello daily growth spurts!) I don't really have an issue with giving them an occasional organic grain. Bake sweet potatoes by wrapping them in foil and placing them in the oven at 400 degrees for 45-60 minutes. Cut the potatoes in half and scoop out centers. Place them on a baking sheet for later. Begin taco meat. Add olive oil in pan over medium high heat and add finely diced onion for 5-6 minutes or until they soften. Add ground beef and mix with onion, stirring and chopping as it cooks. Add 1/2 packet of taco seasoning and combine well until meat is cooked. When ready, mix sweet potato (that had been scooped out) with taco meat and add a generous portion of the mixture to the center of the sweet potatoes. Place back in the oven on 350 degrees to heat up for 5-10 minutes. If you know me at all, you know I am obsessed with bone broth and the benefits of collagen in the diet. If you are wondering what at the hype is all about, check out my post from a few weeks ago, The Top 10 Healing Benefits of Bone Broth. Our family eats chicken soup about once a week or every other week and it seems like I always have some sort of broth in the refrigerator to sip in a mug, warm up for lunches or to use for making dinner. If anyone in the house catches a cold, I immediately start thinking chicken soup to the rescue! So yeah, that's basically why I love it and make it so often. If its healthy, easy, inexpensive AND the kids will actually eat it without protesting, its a keeper in my book. Firstly, I cook a whole organic chicken in the crockpot or roast it in the oven. We have that for dinner one night early in the week. Next, I take all the remaining chicken meat off and put it in a Tupperware in the refrigerator. I save the bones and carcass for chicken broth and soup. **If you don't want chicken soup, but just the broth, then add all the ingredients (minus the shredded chicken) to a crock-pot and cook on low heat for 24 plus hours. Strain and remove bones and freeze if desired. **Affiliate links contained below. Remove excess chicken from chicken carcass and keep it in the refrigerator for later. Place the carcass and all the bones into a large crockpot with a lid. Cover with water, add vinegar and cover. Cook on low for 24 hours, adding water if necessary. Strain and remove bones and carcass. Add strained broth back into crock pot. Heat olive oil over medium heat. Add onions for 3-4 minutes until they begin to soften, then add celery and carrots and cook for 2-3 minutes or until they begin to soften. Throw the semi-cooked vegetables into the crockpot with the broth and the bay leaf. Add parsely, entire container of broth and all other spices and cook on low heat for 6-8 hours. About 1 hour before serving, add (shredded) chicken back into the pot. Season with salt and pepper to liking and add rice. Serve with fresh avocado slices. We make a lot of soup in our house. I'll openly admit it, I'm a bit of a soup gal. They are just so E A S Y to make and the best way I have found to throw lots of tasty veggies into one pot for offering to kiddos. The way soup makes all textures even with eachother has a way of charming kids into eating their vegetables. My favorite part about soup, though, is making it early on in the week so that I can pull together lots of quick and healthy, no-thought-necessary lunches throughout the week. It's really the only way I have energy to meal prep anymore. This Creamy Crockpot White Chicken Chili with kale and avocado is hearty and healthy and of course, gluten free. It’s packed full of fiber from the beans and kale and healthy fats from the coconut milk and avocado and of course it’s got more than enough protein to keep you full and satisfied. It’s a much creamier and dreamier version of your typical white chicken chili, and with some added superfoods and nutrients. Did you know that foods higher in carbohydrates release less of a hormone called leptin, which is the hormone that tells your body it’s satiated or full? Generally speaking, the more protein a food contains, the more leptin is released, and therefore, the more satiated you will feel. Leptin inhibits hunger signals in the brain. That is why you could eat an entire bag of chips and not blink. So not only is this meal healthy and kid-friendly, but it will also keep you and your family feeling full and satisfied! Oh and did I mention, it's D E L I C I O U S ? Seriously, though it's really good. My picky three-year old ate his entire bowl without batting an eye which is unheard of in our household. While this recipe calls for ground chicken, I have also tried it with regular pulled chicken and it turned out just as good. So what are you waiting for? Stop looking and get cooking! Dice onions and garlic and heat over medium heat until they begin to soften. Add ground chicken or turkey and break up meat with a spatula. Cook halfway and mix thoroughly with garlic and onions. When meat is partially cooked and mixed well, add mixture to slow-cooker. Add all other ingredients except kale and avocado. Set on low heat for 6-8 hours. When ready to serve, add diced kale and stir for a few seconds until it wilts. Add avocado slices before serving individual bowls. Why am I always trying to concoct different lentil recipes, you ask? Because lentils are not only one of the highest plant based sources of protein, they are also packed densely with dietary fiber. They are also high in iron, vitamin B Folate + magnesium. They have been known to lower cholesterol, fight atherosclerosis, stabilize blood sugar levels and improve overall heart health. Be warned though. Even with their high nutrient profile, legumes contain some anti-nutrients as well. They contain phytates and enzyme inhibitors and they can diminish the nutritional value of consuming them. Basically phytic acid can bind up minerals and prevent absorption into the body. The fermentation of these legumes within the digestive track can also cause gas! The best method I have found to mitigate these legume "issues" and savor their nutritional value is to soak them overnight in a bowl of water in a warm environment (adding a bit of apple cider vinegar is optional). So without any more legume talk, here is the recipe. It is low in calories and high in nutrition. It is comforting and contains lots of veggies and nourishing ingredients. I really hope you enjoy it as much as we did! Soak lentils overnight in warm environment (adding a dash of apple cider vinegar is optional) to aid in digestion and nutrient assimilation. Strain and rinse with warm water. Add olive oil to large pot over medium heat. Add sausage and par-cook (about 3 minutes), using spatula to break up the pieces into desired consistency. Remove onto another plate. In the same oil and juices (add more if necessary) add onions and garlic. Stir and cook until soft. Add back in sausage and stir. Add lentils, broth and spices. Save salt until the end as lentils tend to dry out if cooked for log periods of time in too much salt. Bring to a boil, then turn down the heat to low and cover for 30-40 minutes. Add kale and stir when it is ready to serve. Though the air may not quite have that crisp fall feel here in Florida, that doesn't stop me from getting excited about all things fall represents: change of colors, cooler weather, football season, pumpkin everything and most importantly; squash season! Butternut squash is easily my favorite squash, mostly because I haven't experimented as much with some of the others. Also because, hello, its delicious! Its so versatile - you can mash it up with butter and make a psedo-mashed potato, you can bake it and throw it atop a salad and best of all you can make butternut squash fries, my favorite! Though I make this chili year round (its that good! ), it tastes even better when enjoying butternut squash in its prime season. Clearly, this chili marks all the boxes. A bonus is that there are typically leftovers in the fridge for lots of quick, protein-packed lunches throughout the week. It saves me from non-deliberately stuffing my face with macaroni and cheese or whatever other delicious foods my kids decide to leave on their plate. Also it is one of those meals that everyone is excited for, especially my husband. He always wants seconds, which makes this food-loving-wifey very happy. Don't cut corners and buy conventional ground beef. The fat contained in grass-fed beef has a higher ratio of omega-3 fatty acids to omega-6 fatty acids. The conventional, corn-fed/grain-fed cows have higher omega-6 fatty acid ratios (Why? Because they are sickly/ill animals due to their diet:lifestyle). Omega-3 fatty acids (primarily EPA & DHA) are essential fats meaning our bodies need them to function. And since our bodies do not make these fats independently, we need to consume them in our diet. A recent study performed by the Union of Concerned Scientists concluded that grass-fed beef and dairy contain higher levels of omega-3 fatty acid that reduces risk of heart disease and higher CLA which has been shown in research to decrease the risk of cancer. You can view the whole study here if you're interested. Okay, okay, I'll step of my soap box about grassfed beef. Just go ahead and try it already. First, sauté the onions in olive oil until soft. Add garlic for 1 minute. Add the ground beef and cook for a few minutes until slightly brown (not fully cooked). Then add all the ingredients to the crockpot, leaving the chicken broth for last- fill pot until liquid almost covers the top but not fully. Stir and set to low for 6-8 hours. Add your favorite toppings and enjoy. My favorites are sour cream and shredded cheese. Here is an easy, healthy weeknight meal that kids will enjoy too. It is packed with nutrition from the broccoli, the healthy fats of the grass-fed steak and the avocado and all of the nutrients in the sprouts. Do you know how crazy healthy sprouts are? They are literally full of every vitamin and mineral under the sun and they prevent against cancer, anemia and are great for your skin and eyes. I have been on a bit of a sprout kick lately and have found them so easy to add to literally every meal (sandwiches, salads, eggs, etc) I somehow managed to convince my three year old they would give him super-powers with all of its healthy benefits and he eats them now with little to no encouragement. This takes a tiny bit of prep work with the marinade but overall, it's pretty simple. 1. Add all ingredients for marinade into a zip-lock air-tight freezer bag. Cut the skirt steak into four equal pieces. Run knife along the striations of the meat to improve entrance of flavors. Sprinkle salt and pepper on both sides before placing it in the bag. Mix it up for a few minutes and massage the meat. Marinate for 5 hours to 1 day before. 2. Cook rice and broccoli. (1 cup rice to 2 cups water) When water boils, add rice, turn heat to low and cover for 20 minutes. Steam broccoli in separate pot. 3. Add olive oil to large brimmed stainless steal pan and turn burner to medium/medium-high. Cook the steak on medium-high heat for about 5 minutes on each side, until only slightly pink on the inside. 4. While steak is cooking, make the spicy mayo. Place all ingredients into a small hand blender and blend on high. 5. Slice steak and assemble avocado, sprouts, broccoli, green onions, steak and spicy mayo atop rice bowl. Add sesame seeds and a splash of lime if you prefer extra flavor. 6. Mix it all up or not if you're like my kids and don't like your foods to touch. 😂 Enjoy!